Geothermal energy utilizes the heat created and stored within the Earth. Direct use resources are generally classified as low temperature (<150°C) or high temperature (>150°C). Low temperature resources can range from the ambient temperature of the earth (~40-60°F) that is suitable for use by a ground source heat pump. Direct use resources can be utilized for space heating and limited electricity production. Many areas of Wyoming (see geothermal resource map) contain geothermal (“earth-heat”) reservoirs of low-to moderate-temperature water — 68°F to 302°F. These resources can be harnessed to provide direct heat for residential, industrial, and commercial applications. Geothermal energy has many uses, including heating buildings, greenhouses, fish farms, food processing, and more. Geothermal can also be used to generate electricity, although this typically occurs at areas with higher temperature resources than found in Wyoming (outside of Yellowstone). Direct use geothermal can be a cost effective heat resource where available. If you have access to a direct use geothermal resource, please contact CES for assistance with utilizing this resource. Learn more about direct use geothermal from the Department of Energy, Office of Geothermal Technologies. If you have ever been in a cave, you know that despite variations in the outside temperature, the cave’s temperature remains constant. In Wyoming, subsurface temperatures generally range from 45°F in colder regions (e.g. Pinedale) to 55°F in warmer areas (e.g. Torrington). This near constant temperature, a renewable resource, can be tapped by a GSHP to serve as both a source and sink for heat. In use since the late 1940’s, GSHPs concentrate this resource in the winter to create heat and diffuse energy in the summer to create cooler interior temperatures. To utilize a geoexchange system, piping is generally placed in the ground in either a horizontal “slinky” system or through vertical wells. The systems are generally closed-looped, circulating fluid to extract or insert heat into the ground. This fluid is then run through a heat exchanger to supply a forced air, or radiant heat, system that is similar to a typical furnace or air conditioner. Through the use of a heat pump, the temperature of the delivered air, when in heating mode, is raised to 90-105°F, well-above the ambient temperature of the ground. Although systems may be equipped with a backup heat source, a well designed GSHP concentrates enough warm or cool air, much like a refrigerator does, that there is generally little need for supplemental heating or cooling. 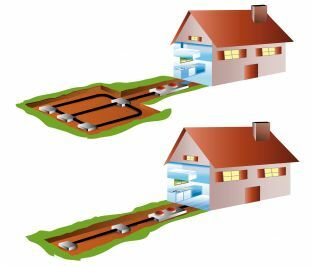 Ground sourceheat pumps can be a very cost effective solution for space heating and cooling in residential, commercial, and governmental applications. You are able to utilize tax credits. Efficient – As GSHPs are moving heat, not creating it, they can achieve high levels of efficiency (300-500%). A typical high efficiency furnace is 90-96% efficient; GHPs are much more effective at moving heat, using 1 unit of electricity to create 3-5 units of usable heat or cooling. Safe – As GSHPs are not burning fossil fuels, there is no risk of explosion or carbon monoxide poisoning in buildings. Reliable – GSHPs generally last longer than traditional furnaces or air source heat pumps. The in-ground loop fields often come with 50-year guarantees. Low operating cost –Once the system is installed, the high efficiency of the system reduces operating costs. In addition, Wyoming’s cheap electricity makes the input to the system relatively low cost. Up front Cost – GSHPs are significantly more expensive than a standard furnace/air conditioning combination. Please see the cost discussion for more information. Need for adequate area – Although GHP loop fields can be placed either horizontally or vertically, which requires less space, the systems do require disturbance to existing landscaping and access for heavy equipment. Not all properties, especially urban or commercial properties, will be appropriate. Occasional Incompatibility with existing duct system – GSHPs deliver a lower temperature heat source (90-105°F) than most fossil fuel systems. In some cases, existing duct work may be undersized and require enlargement. Ground source heat pumps are eligible for significant federal tax credits, grants (for businesses), and utility incentives. For example, residences can receive a 30% tax credit on the entire installation costs; businesses are eligible for a 10% tax credit. Many utilities also offer incentives for GSHP installation. Please visit our discussion of Incentives for additional information. [/toggle][toggle title=”How much does a typical ground source heat pump cost?”]It is difficult to offer a standard price for GSHP installations due to differing site conditions and requirements. As a rough rule of thumb, a system costs $3,000-5,000 per ton of capacity. A standard (1500-2000 square foot) Wyoming home requires a three ton system, with an installed cost ranging from $9,000-15,000. This does not include incentives. Although little Wyoming specific data exists, an overview on price structures is provided by the Department of Energy, Geothermal Technologies Program.